(Egypt, 1951). Is an American memoirist, essayist, and New York Times bestselling novelist. His work has appeared in The New Yorker, The New York Review of Books, The New York Times, The New Republic, Condé Nast Traveler, The Paris Review, Granta as well as in many volumes of The Best American Essays. Aciman is the author of the Whiting Award-winning memoir Out of Egypt (1995). His books and essays have been translated in many languages. 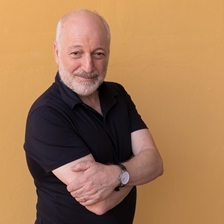 In addition to Out of Egypt (1995), Aciman has published False Papers: Essays in Exile and Memory (2001) and Alibis: Essays on Elswhere (2011), and four novels, Enigma Variations (2017), Harvard Square (2013), Eight White Nights (2010) and Call Me By Your Name (2007), for which he won the Lambda Literary Award for Men's Fiction (2008). His novel Call Me by Your Name has been turned into a film (2017), directed by Luca Guadagnino.